Are you a car enthusiast? Then, this car show is for you. Display your car or motorcycle at Cars, Coffee & Conversation! Cars and motorcycles from a variety of eras will be showcased at this free family friendly event. Spectators are welcome and the show is open to the community. Mitch Leben, owner of Mitch's Motors Detailing, will host a car detailing demo. 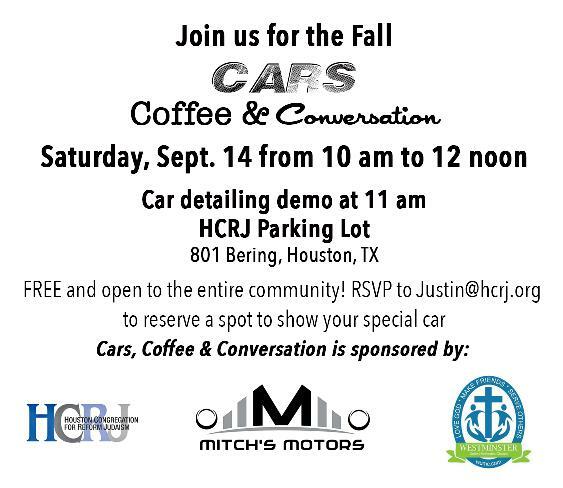 Sign up to display your car or motorcycle: RSVP to Justin at 713-782-4162 or Justin@hcrj.org to reserve a spot in the display area. Hosted at Houston Congregation for Reform Judaism. Sponsored by HCRJ, Mitch's Motors, Westminster United Methodist Church and Bethel Church.